It eventually got very chaotic last September, when I knew Ys VIII was releasing very soon, and I also picked up Tokyo Xanadu, Ys Origin and Odin Sphere. Then, a few weeks later, Super Mario Odyssey was released and well, I wasn’t going to wait to play that, so I put everything else on hold and practically rushed 35 hours to finish it. I was also trying to get into my brand new beautiful PSP and play the seven or so games I had picked up on it. Then, it all went south with the release and subsequent frustrations of Xenoblade Chronicles 2 in December. During all of this, I wasn’t completing anything, but I was taking breaks after ~15 hours in several lengthy games, making myself perpetually behind. It was a vicious cycle! A new game would come out, so I’d drop the other games and start something brand new. Normally I finish 1-3 games per month, but all the games I was playing were super lengthy, meaning I was doing tons of playing and not a lot of finishing. So, how did I break the cycle? I went through my backlog of about 30 games that I already owned, and decided which ones I actually had a desire to play. Again – the purpose of this wasn’t to force myself to play games I didn’t want to play, it was to play the ones that I was excited about. Games I owned like Soul Sacrifice on the Vita that I didn’t really enjoy the first time, I knocked right off the list. Eventually I ended up with 11 games. 11 titles that I wanted to play, and didn’t simply feel guilty about not playing them. Sometimes the damn shoe doesn’t fit, and no amount of shoehorns, KY Jelly, and sheer force will get it on your dumb foot. The next thing I did was order my HowLongToBeat page by estimated completion time, and I went right down the list, completing each game, from the shortest game to the longest. I was actually beating about 1 game per week, even completing up to three in a week at one point! The feeling of victory behind playing games was actually coming back and I was getting super motivated again. I wrote about DOOM 2016 so damn long ago but, like everything else I started, I never finished it. Following all my victories however, I was able to not only finish it, but I logged over 20 hours getting a 100% completion, which is a lot for an FPS, just because I was having so much fun with it – something I hadn’t felt since I was constantly trying to keep up with the latest releases. I even got to the point where I started adding in more games that I already had – and finishing them! Ys VI and Doki Doki (which is free and thus did not count against my goal) were two incredible additions. Of course, some of the games have not performed to my expectations. Final Fantasy VII: Crisis Core on the PSP started off well enough, but I grew bored fairly quickly with the simplistic battle system and seeming lack of control and heavy RNG during fights. Yomawari: Midnight Shadows I am shelving and planning to try again around Halloween time – a horror game just wasn’t what I was feeling after playing Undertale. The first takeaway here is that if the game isn’t feeling right, just stop playing it. Remove it from your backlog. If you feel an aching pain to play it again, you can still do that! But once you’re spending time doing something because you left yourself a bullet point to do so, it ain’t gonna be much fun. If it comes up organically, you can always backlog it again. That’s the first takeaway, however. Something else happened during the past couple of months that I never thought was possible. I straight up stopped caring about new releases. No longer was my focus on constantly having all the new stuff – if I didn’t want to play one of the few games left in my meager backlog, I just grabbed something off my shelf. I tried some new stuff – I had a still-sealed physical copy of Hollow Knight which I went ahead and finally installed. Turns out, I didn’t really like it too much and I also realized I’m extremely sick of metroidvanias. No problem! I removed it from the backlog after an hour of gameplay and that’s that. I installed Wasteland 2 which I had in an IndieBox – “this is waaay too complicated for me” was what I realized in about 25 minutes. I used to love this kind of game as a kid, but I simply don’t have hours or willpower to learn a game of this depth. Hell, I even re-installed Half-Life: Source from Steam just to change it up, and it also didn’t feel right. I took a whole week off my list and just played Rocket League and Mario Kart 8 Deluxe! But not once did I stray from the original goal – I realized just how much stuff I already had and that there were plenty of options of stuff to play. I didn’t need all the new games. By the time I want to get into all these games coming out on the Switch, they’ll have dropped in price anyway! But let’s take a look at the games I’ve finished this year, shall we? Hatsune Miku: Project Mirai DX – I absolutely adored this game and I still listen to the soundtrack via my 3DS! I also wrote at length about it. Axiom Verge – Terrific title that everyone should play. Great tribute to the Metroid games and addicting gameplay. I wrote about this one as well. Ittle Dew 2+ – I’d love to write about this one at some point, but it’s been a while since I finished it. Very underrated and underrepresented game on the Switch that plays just like a Zelda game. Doki Doki Literature Club – This game actually screwed up my sleep for about a week. I didn’t stop thinking about it for a long time. It’s a free visual novel available on Steam that you need to play to understand. Castlevania: Lords of Shadow – Mirror of Fate HD (3DS) – I haven’t played a Castlevania title since Portrait of Ruin on the DS, and I liked it a lot. This was a fun game that you could really feel yourself getting better at the longer you played it. Recommended but not perfect. Undertale – I’m all over the place on this game. It was a lot of fun but in the mania of playing tons of games, I started and finished it quickly. Still need to do a pacifist run. DOOM 2016 – Everyone who has ever played a shooter needs to check this one out. It’s completely insane and a perfect callback in every way! I wrote about this as well. Ys VI: The Ark of Napishtim – In the same vein (and engine) as Ys Origin and Ys: Oath in Felghana comes this terrific title. It plays exactly the same as the aforementioned games and is a great way to spend 10 hours or so. Ys VIII: Lacrimosa of Dana – A clear contender for my game of the year, I can’t tell you how much I loved every minute of it. The characters are beautiful and the personalities will make you miss the crap of everyone when you finish it. A gem from start to finish. In essence, what ended up happening that was totally unexpected was that I gained a huge appreciation for what I already had. 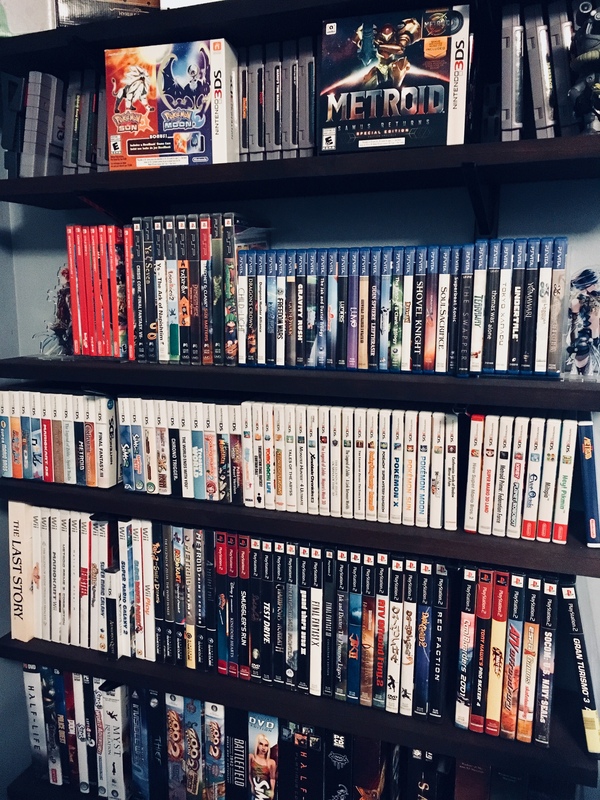 Every game on my shelf tells a story – how I came to procure that game. The time I spent playing it, if I’ve played it. What I read and watched about it before I decided to buy it. It’s also changed my attitude when it comes to hearing about new games. I used to run to Amazon and pre-order games immediately, but the mania of blogging and trying to stay current can only go so far with the time that I have available. I gained a whole other perspective about staying current with media and that perspective, to me, is worth a lot more than the hundred bucks or so I didn’t spend buying new games. Going forward? By wrapping up the games I own first, I can 100% focus on the newer titles when I have a chance. That being said, I’ll keep focusing primarily on playing what I already have, because there are still a bunch of titles I own that I’d like to enjoy first. Final Fantasy XII on the PS2 that was donated to me. The remaining two titles in the Ratchet and Clank Trilogy I have on the Vita. Oddworld: Strangers’ Wrath, also on the Vita, which I got from LimitedRunGames but never finished. Ys Seven on the PSP. There’s a solid pile of great games I can swap into my backlog at any moment, but they don’t come with the pressure attached when I play them this in this manner. It is possible to take a break from the pre-order mania and enjoy what you’ve already got. Maybe someone will read this and give it a shot! Previous Post Previous post:A Happy Secret Valentine’s Day to…. The Gaming Diaries! Next Post Nintendo Switch Titles on Geddy’s Radar! I like what you did. I am kind of writing something up literally titled “F*** the backlog”, because it’s driving me nuts. So many new games are out that i actually do what to play, however my backlog is already huge. At first I thought I’d play through it just to make sure i completed every game in there, but as you pointed out, some games just don’t click with me. Just a bad purchase really and I have to come to terms with that and move past it sometimes. I mostly blame Steam sales for this. Having a backlog lead me to 2 situations, trying to rush to complete the backlog, and rush to complete new games so i can get back to old games. It drove me crazy and really drained me. So now I’m just kind of freestyling it and enjoying it more. Ah man, sorry it turned into a grind for you! The backlog can be the antithesis of fun, it certainly can be. On a side note though, what makes this possible is that I only take on shorter games (5-20 hours normally). Otherwise I’d be right back where I left off! I’ve been buying more games but that’s mostly because a) they’re shorter games, and b) I’m planning for the winter, where there seems to be a pretty big dry spell for releases I’m interested in. Also, looking forward to reading this post! Glad to have ya back doing the bloggin’ thing. I stump for Doki Doki Literature Club to anyone that will listen. What an amazing experience. This is very similar to my situation. My backlog’s getting a little out of control. I’ve come to realize with some games, the act of buying it and adding it to my collection is the main reason I wanted it! Which is okay I think because out of all the uses for my money it’s not a bad use, It’s a game I could eventually get around to and enjoy even 10 years from now! It’s hard because sometimes when relegating a title to the end of a backlog it kinda feels like giving up.. but if I’m not enjoying it, or if there are games I want to play more then I should just do that. I think some games can become a chore to complete and I’m trying to teach myself to find the balance between getting into a game to see if it’s enjoyable.. and putting it down to play something I’m really keen on. Just realized my blog linking was all wrong, I can’t edit my previous comment, but this comment should be okay. Good advice, for me the first takeaway is most important: don’t play any further if you’re not enjoying yourself. Other then that, I find my self immersed in some big Switch games that manage to keep my interest. Much better for my finances! Last time I counted my backlog it was around 190 games, it is almost a year since I counted and that number is probably around the 180 mark. I think counting how much I was spending helped me stop buying things I didn’t especially want. Thanks for posting this. Sometimes I get stuck in a loop of realizing I have too much to play, picking something randomly that I’m not in the mood for, getting bored and putting it back on the shelf, and repeat ad nauseum. The thought of just going with something you’re excited about, even if it isn’t towards your own goal necessarily, is a great idea. Thanks again! Definitely adding dragons cafe to my list! This is a great gaming habit to get into. It’s easy to feel guilty about not finishing games, even if you aren’t too fussed about them, so it was nice to read this. This is so good to hear. I’m glad it is going well for you and making you think about what games you actually want to play. I’ve bought a few games this month, which I would have got round to trying a bit more had I not been struggling to hold a controller or handheld… but these few plus my backlog (the ones I actually want to play and play soon) will keep me going for a while. I had bought a couple in January and completed a couple of them but one is still waiting to be played. To be honest the next game release that I’m really excited for is in the summer. I’m going with what my mood feels like playing at the moment even if I chop and change game a bit, doing a few levels here and going to a different style of game for a while and some to go back to just for fun. My blog may end up being chat about a lot of older games or a lot of Games with Gold titles but that can mean that someone sees something they overlooked originally. The most important thing is that I enjoy what I am playing and if I don’t I can stop, I can talk about why I don’t enjoy it but I don’t need to finish it just because I have it.